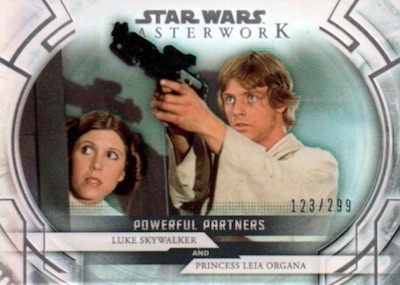 The hit-per-pack Star Wars set is back with 2018 Topps Star Wars Masterwork. Exclusive to Hobby, every box includes two autographs and two additional hits. While fundamentally similar to the 2017 product, the 2018 release showcases several new options. Making a strong impression, base cards are printed on 72-point stock. 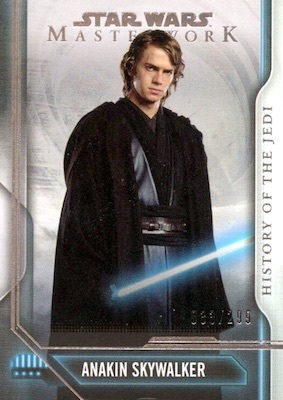 This 100-card set covers the entire franchise and adds 25 short prints. 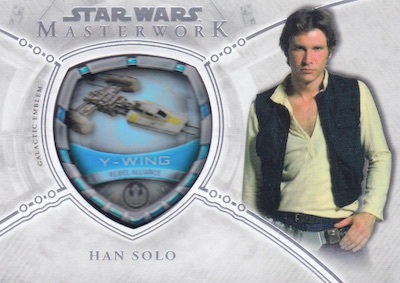 If you are wanting to make a premium Star Wars rainbow, options consist of Blue (1 per pack), Green (#/99), Purple (#/50), Orange (#/10), Black (#/5) and Gold (1/1) parallels, as well as Printing Plates (1/1). 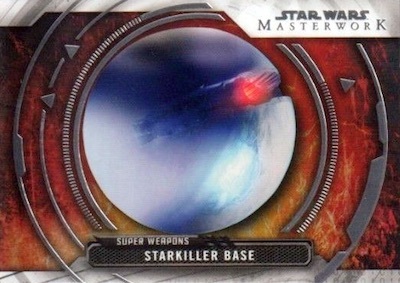 Inserts come one per mini box via History of the Jedi, Powerful Partners and Super Weapons sets. These insert parallels are different than the base cards, though, with Rainbow Foil (#/299), Canvas (#/25), Wood (#/10), Metal (#/5), Gold Metal (1/1), and Printing Plates (1/1) to chase. 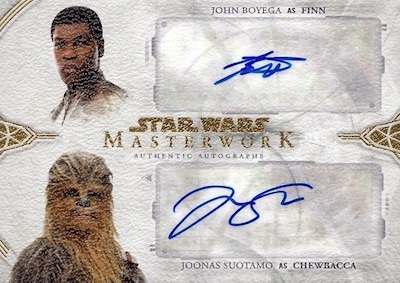 Visiting most of the stops in the saga, from the original films to Rogue One and The Last Jedi, the 2018 Topps Star Wars Masterwork checklist promises over 40 actor Autographs. Among the more limited versions are Blue Foil (#/99), Rainbow Foil (#/50), Canvas (#/25), and Wood (#/10) parallels, plus low-numbered Silver Framed (#/5), Gold Framed (1/1) and Printing Plate (1/1) cards. Combining several characters, the Dual Autograph and Triple Autograph cards have Canvas (#/25), Wood (#/10), Black (#/5), and Gold (1/1) parallels. More signed choices include Heroes Autograph Book cards, Villains Autograph Book cards, and Quad Autograph Book cards. 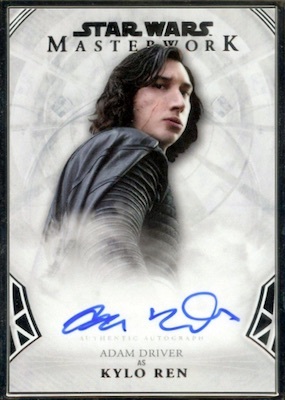 Autographs naturally fill much of the selection, but there are other hits to find in 2018 Topps Star Wars Masterwork. The Commemorative Patch and Commemorative Patch Autograph sets are new choices featuring plastic pieces. 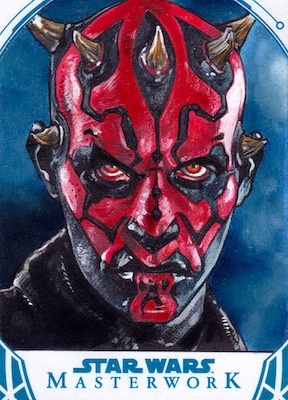 There are also Sketch cards, Sketch Book cards and Stamp cards. Buy 2018 Star Wars Masterwork boxes direct from Topps for $199.99. 125 cards, including 25 short prints. PARALLEL CARDS: Blue (1 per pack), Green #/99, Purple #/50, Orange #/10, Black #/5, Gold 1/1, Printing Plates 1/1. 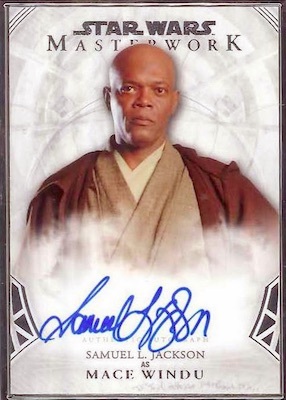 Buy 2018 Star Wars Masterwork autographs on eBay. PARALLEL CARDS: Blue Foil #/99, Rainbow Foil #/50, Canvas #/25, Wood #/10, Siver Framed #/5, Gold Framed 1/1, Printing Plates 1/1. PARALLEL CARDS: Canvas #/25, Wood #/10, Black #/5, Gold 1/1. 1 card with 10 signers. 47 cards. Serial numbered #/175. PARALLEL CARDS: Purple #/50, Black #/5. 24 cards. Serial numbered #/200. 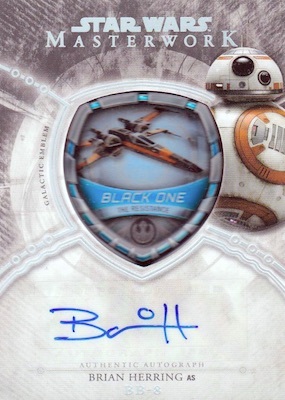 S-BP Poe Dameron - BB-8! S-CH Han Solo - Chewbacca! S-CL Lando Calrissian - Chewbacca! S-KC Captain Cassian Andor - K-2SO on Scarif! S-KJ Jyn Erso - K-2SO on Scarif! S-KK K-2SO - K-2SO on Scarif! S-MF Finn - Maz Kanata's Castle! S-MH Han Solo - Maz Kanata's Castle! 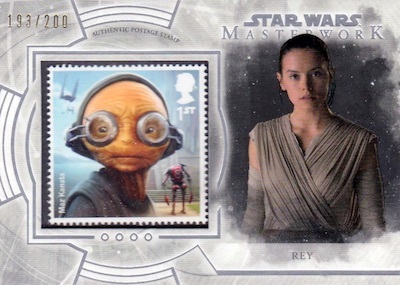 S-MR Rey - Maz Kanata's Castle! S-PC Chewbacca - Ahch-To Island Porgs! 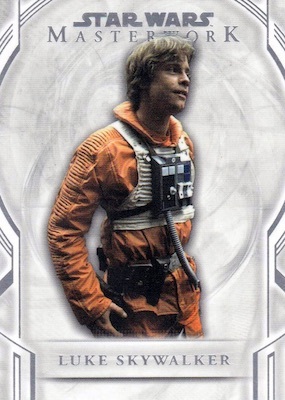 S-PL Luke Skywalker - Ahch-To Island Porgs! S-PR Rey - Ahch-To Island Porgs! S-RA Anakin Skywalker - R2-D2! S-RO Obi-Wan Kenobi - R2-D2! S-RP Padmé Amidala - R2-D2! PARALLEL CARDS: Rainbow Foil #/299, Canvas #/25, Wood #/10, Metal #/5, Gold Metal 1/1, Printing Plates 1/1. Really nice cards, good design, lots of on-card autos, decent checklist. Just, yet again, way too high a price point for what you get from a box. This would be 5 stars if prices were $70-$80 for master box. Love this set! Are the sketch cards also done on 72 point stock? I have not seen any in person but the stock does appear to be thicker than normal based on the images online.